Ancient Stones - Borders - 008 Standing Stones, Menzion, Tweedsmuir. 008 Standing Stones, Menzion, Tweedsmuir. Two standing stones on the north side of the road between Tweedsmuir and Fruid Reservoir form part of a group of three stones, the third being the Giant's Stone. The area is well screened with conifers but would have been easily seen from afar prior to their planting. From the A701 Penicuik to Moffat road, take the sign posted junction for Tweedsmuir village. Leaving the car in the gravel parking area on the south side of the village, walk along the single track road heading up to Fruid Reservoir. The stones can be found less than 1 mile along this road and are easily seen on the left. There is no parking beside the stones and vehicles should be left at the gravel area beside the monument in Tweedsmuir village. 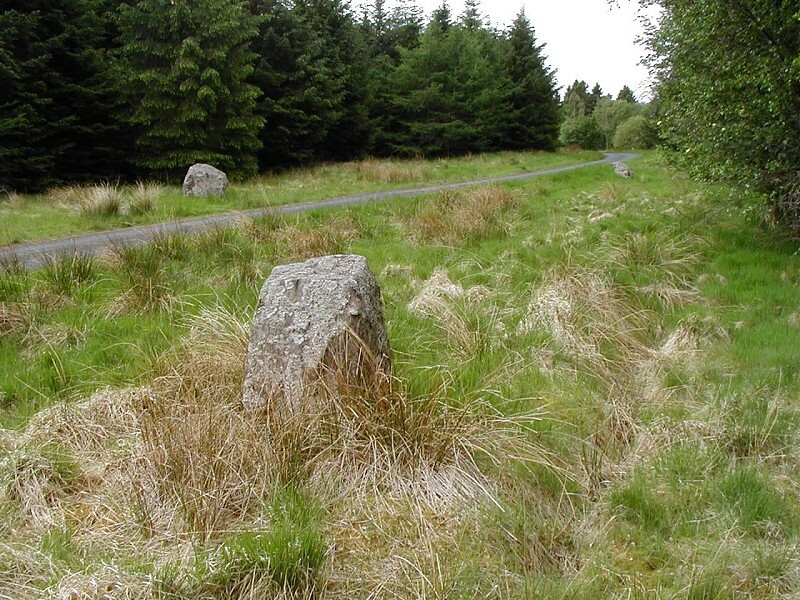 The two stones, with the addition of the Giant's Stone, form a group of three standing stones that straddle the minor road to Fruid Reservoir. The stones are believed to be ancient but their purpose is not recorded and perhaps long forgotten. Records state that there were other stones in the group many years ago, although these have been carted away for other uses, perhaps for dry stone walling. They may even still exist, all be it now broken, in the walls of the church or houses at Tweedsmuir village. There are numerous ancient settlements and burial cairns in the area and it might not be too far fetched to speculate that a stone circle once stood here. 007 Giant's Stone, Menzion, Tweedsmuir.